Road and travel guide in Europe and France, maps of Paris, London and other big cities, access maps, tourist and practical information. Very handy to calculate your driving costs. Handy visual tool to calculate your itinerary from A to B, and from B to C and so on. Printing and sending it to somebody is easy. Rent a car from Avis. Car rentals easy to book online at Avis.com. Find your map of the trains in every french region. Information and online Booking. Best Book in French version. Count 10 days to receive your tickets home or save money by printing it directly. Tickets printable at every French station in so called "Bornes". Take care for the wright spelling of station names. Often you can choose your own seats. Not very user friendly, a little slow, but very interesting prices to be discovered, especially when booked early. Lastminute travels available every tuesday. Cheap prices often not to be modified, nor money back. Eurostar journey times from the UK to France and Belgium are reduced. 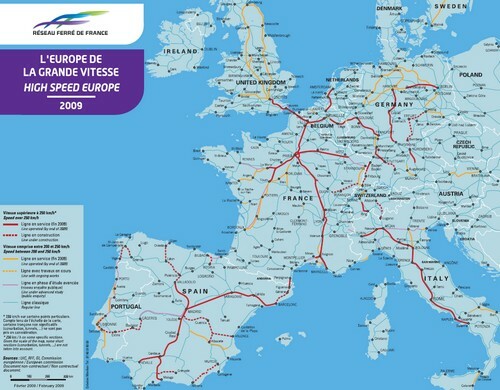 High speed trains, travelling at speeds of up to 300km/h, will whisk travellers from London to Paris in just 2H 15 minutes, and to Brussels in 1H 51 minutes. Discover France "en TGV". Informations about the TGV network, services, prices, timetables & station maps. With this link you see all airports in France. Book cheap flights online with easyJet. Find low cost flights to Europe, find a flight offer that fits your budget. The Low Fares Airline, cheap flights from Europe, UK and Ireland. Discount airline tickets. Dijon airport will have a low cost airline between Southampton-Dijon. Ferrycheap.com delivers fares from all of the UK's major ports. Served by the UK's most competitive ferry operators: Norfolkline (Dover - Dunkerque), P&O Ferries (Portsmouth - Bilbao, Dover - Calais, Hull - Europoort, Hull - Zeebrugge) and Seafrance (Dover - Calais). Eurotunnel operates from Folkestone to Calais. This service speeds you across to France in less than 40 minutes. As a public corporation answerable to the Ministry for infrastructure, housing, transport, tourism and the sea, Voies Navigables France acts in close cooperation with institutional partners and waterway users. Fédération française des Usagers de la Bicyclette: Bike+train, practical guide by the French Federation of Bicycle Users. Hotel in France Book your hotel online in France. Easy to use. Jeff Steiner's Americans in France. Resource for people that would like to live or travel in France.